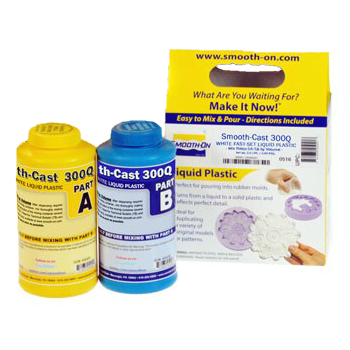 Smooth-Cast is an easy to use, low viscosity, plastic resin. Available in white, off white, and pigmentable options. A 1 to 1 mix ratio, Smooth-Cast is "Perfect for casting detailed models, prototypes, props and cast effect pieces." This product is sold in a 2lb trial size. Please visit Smooth-On.com for additional technical support, product information, and project ideas!